Back for 2019, Student Volunteers can design the T-Shirt they will receive at the conference! 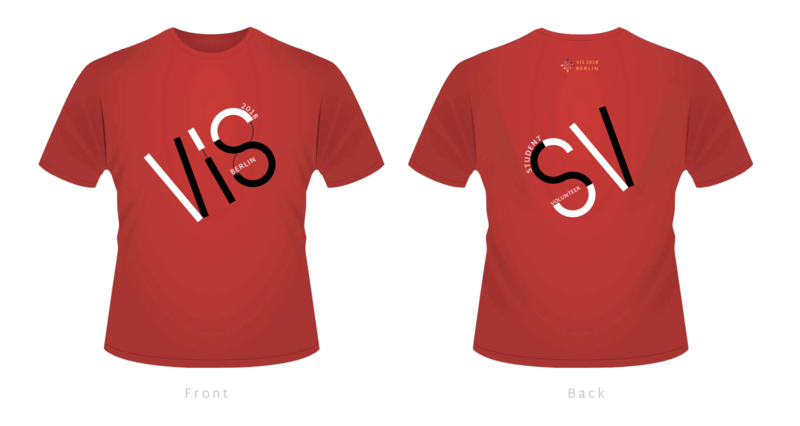 In order to participate in the contest, you need to be eligible to be a Student Volunteer at VIS this year and submit a T-Shirt design before the June 15 deadline. The winner will automatically be selected to be a Student Volunteer on top of being acknowledged for designing the T-Shirt. To be able to qualify to the Student Volunteer T-Shirt contest, students must be eligible for being a Student Volunteer, and agree to the duties that come with it. Please see the home page for the general information. We accept one design per person, and each design should be single-author. Send your design to visweeksvchairs@gmail.com before midnight PDT on June 15, with the subject: VIS18 SV Shirt Contest - FIRSTNAME LASTNAME. Design file -- .png, .jpg, .pdf, or .svg. Participants to the contest must then apply to be a Student Volunteer during July to remain eligible. The SV chairs and the conference committee will select a subset of the designs. Then the community will vote for their favorite of those pre-selected designs through an online voting system. We may ask the contest winner to make some small changes to the original design. If the design uses live/changing data, the data must be frozen by the IEEE VIS early bird registration deadline. The T-Shirt is two-sided. The design must show both the front and the back of the T-Shirt if you plan to submit a two-sided T-Shirt. However, it is not mandatory and you can submit a one-sided design. Four mandatory elements must be in the design: the VIS logo (link), a mention of the year "2018," a mention of the location "Berlin," and a mention of "Student Volunteer" "SV" or similar. The T-Shirt color should be noticeable, i.e. no black or white. You are free to pick any color for the T-Shirt. Colors for images are limited: you can use up to four different colors for the front, and up to four colors for the back. They do not have to be the same. The design cannot extend to the seams (side or top) or use the sleeves. Our printer provides a standard rectangular area that stops several inches from the seams. June 15: deadline for sending your design. July 1: pre-selection of up to 5 designs, opening of the voting phase.